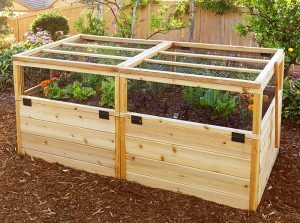 Our Just-Add-Lumber or “Lumberless” vegetable gardens let you save money on your garden project by avoiding the need to ship lumber. 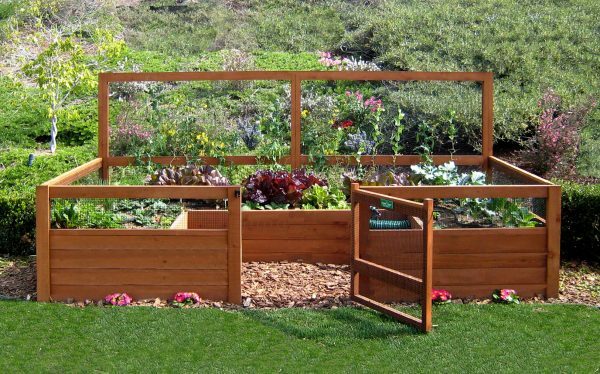 Included with our Just-Add-Lumber gardens are our Raised Garden Bed Brackets, all necessary hardware, black netting for the trellis and fencing, and a complete set of detailed instructions and plans. Save money by buying your own lumber locally. 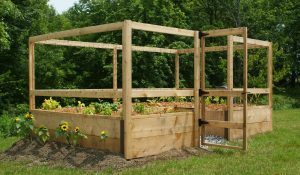 Our “lumberless” garden kits enable you to build gardens nearly identical to our Complete Fenced Vegetable Garden Kits. 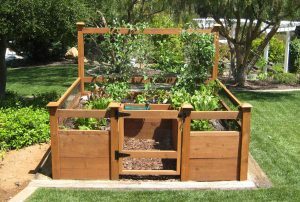 We provide Raised Garden Bed Brackets, all necessary hardware, black netting for the trellis and fencing, and a complete set of detailed instructions and plans. 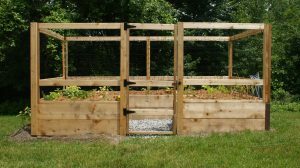 Just like our Complete Fenced Garden Kits, our “lumberless” garden kits keep out rabbits and dogs. Of course, our instructions list the lumber boards you’ll need to purchase as well as the exact sizes the lumber boards will need to be cut to. If you don’t have a saw, ask the lumber company to cut the lumber pieces for you. If you’d like to add the Automatic Watering System to your garden, it is available separately for $180. This garden provides approximately 45 square feet of planting space and is recommended for families of up to 4 people. An automatic soaker hose irrigation system takes even the simplest of duties out of your hands. We use a digital battery operated controller, manufactured by DIG Corporation, that is very easy to use. You can attach a garden hose to the inlet fitting, or connect it to your underground piping. When the controller turns on, water seeps out through the 50′ soaker hose (hose stakes included). You’ll never need to worry about watering your garden-it takes care of itself. We also include a coil hose and hose holder along with a vegetable sprayer. You can manually spray your plants if you choose to, or use the hose to wash your hands. The coil hose is conveniently mounted in the walkway of the fenced garden. 7 decorative flat bottom post caps 3'x18' galvanized wire mesh for flooring (1/2" grid) to keep out gophers and moles. 20" high growing beds - no stooping required.